Nice jacket. Very well vented. Cool in cool weather. Have removable vest liner. Got my son one. I live in Texas, and with the hot summers here, needed a jacket that offered good protection, while at the same time had a lot of air flow to keep me reasonable cool. Good review from buyers for a summer riding jacket. A good every day, around town riding jacket. I love this jacket! It's well made and looks great and fits perfectly with lots of room for adjustment! The air flow is especially excellent for summer riding and the protection in the shoulders and elbows is great and there's a back protector insert as well. This is not a cold weather jacket at all and you will want to swap it for warmer gear come Fall for sure. Lots of pockets and a decent removable liner that covers the torso only--no liner for the sleeves. You will love this jacket too! The color I wanted in the yellow to match the bike. Looks like it will breath like I want and move with me. Hopefully a good purchase. Have have another Joe Rocket jacket and love the fit, this one had good reviews and I liked the style. I LIKED THE STYLE AND THE SAFETY FEATURES OF THE JACKET. Wanted a newer Mesh riding jacket. Sizing for this jacket is HUGE. Had to send back and order another brand that I knew fit. I trust Joe Rocket products............They have been in the game for 20 some odd years and know what we want and need. Cause you should wear gear. I was torn between the Resistor and the Reactor. I went with the Resistor because it felt lighter and I will be wearing it during the spring/summer/fall in Northern Virginia where it gets pretty darn warm! Needed a jacket for summer riding, already own a joe rocket jacket and I love it,however it's to hot for summer riding, so I purchased this one also. This looks to have everything I was looking for and had positive reviews. Took a shot in the dark and was happy with my choice. I like the color scheme of this jacket as well as the protection. It was recommended by a friend and I watched your video. Just looking for a jacket to go with my Yamaha blue and Joe Rocket is a good name. Was looking for an "in-between" jacket to accompany my weatherproof winter and full mesh jackets. Joe Rocket is great value for money overall. Just the styling I was looking for. Excellent price, materials, style, protection and comfort. Joe Rocket just fits right for a slender guy like me! Are we going to get a review on this soon? I am on the fence about purchasing it. These shoes are very similar in fit to my high top Nike workout shoes. They do not have high heels. Just got mine today...go for it...you won't be disappointed. Yeah, thanks Jimmy but that was a few years ago. BEST ANSWER: Nope, you'll get wet in this one! It does have a waterproof zip up interior pocket though..
What type and size back armor is compatible with this jacket? BEST ANSWER: Forcefield Pro Lite K size 002 fit this jacket. I have a icon jacket in large. are joe rocket jackets about the same size wise ? BEST ANSWER: I normally wear an XL in most clothing. I went to a local brick and mortar store and tried on a Joe Rocket Phoenix Icon in XL and it was too tight. I tried on the XXL and it fit perfectly. I then ordered a Joe Rocket Resistor jacket in XXL and it fits great! im 5'6 and i weight 167 should a get a small? BEST ANSWER: I'm 5'8" and 165 and I bought a small and I like the fit. What (how many) pockets do this jacket have? BEST ANSWER: 2 on the outside where you would put your hands and a small one on the inside. I'm a very new rider (will get my license tomorrow, if all goes well with the riding evaluation) and was looking to buy gear. 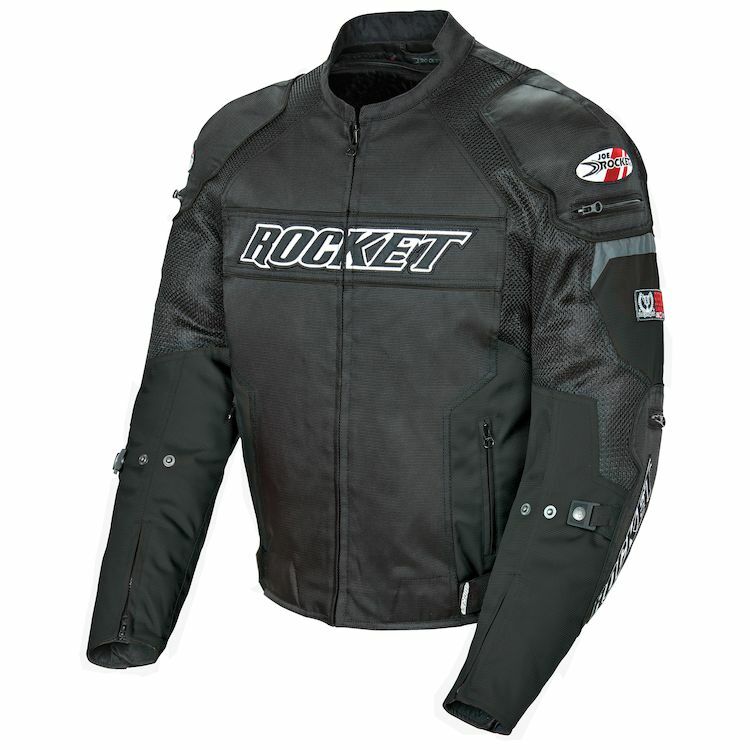 I like the look of the Joe Rocket products and like the Joe Rocket Resistor Jacket. I'm 5'11", 180 lbs with an athletic build. Can you please recommend an appropriate JR jacket size for me? BEST ANSWER: I decided to go with the Joe rocket resistor jacket. It works well and for my frame it's good. 6'1" 180lb I got a large which was probably good to make sure it covered my torso, but overall there still is quite a bit of excess material around the chest. It does have straps to tighten around the bottom but the material sits around the shoulders if the size is too big. I had to make some minor adjustments to fit properly. So having said that, I am sure that a medium would fit you, especially since you'll be in the tuck and most of JR products are true to size. Plus on a sports bike you want something a bit more snug. I'm 5'7" 140lb and own a size "small." It fits me snug, but not tight, just right. This is the second Joe Rocket jacket I've owned, and can't speak more highly of their quality, comfort, or functionality. Perfect jacket for 60-80 degrees plus it has a liner. Although, it has vents, and is breathable, it gets hot in there when above 80 degrees outside. Good luck and enjoy your new ride. I purchased this jacket when I was a brand new rider (6 months ago so I still consider myself a new rider). I love it. It's got a liner you can take out for those warmer days. I got a size Large and It fits great (i'm 5'8, 200lbs so a bit stocky). I also got the Icon Compound overpants (kinda mixing two brands but it works for me). I'm 5'9"-5'10" and weigh 95kg (209lbs) I have quite large shoulders. I chose the L and while it fit me well around the waist, chest and shoulders it is a little bulky/roomy in the gut area, just above the waist. Nice jacket though and comfortable to wear. Hi , I'm Swiss I don't know the US measure . I'm 182 cm . And about 90 kg . And the size I chose was little bit big . If you're not overweight than buy a size down . I should've go for L instead of XL . Besides of that is the jacket very nice to wear . BEST ANSWER: It is a combination of textile and mesh. Is the jacket good for cold weather? BEST ANSWER: Everyone's definition of 'cold' is different, of course - but I wear mine in the summer. The lining is removable and most of the jacket is ventilated. Even with the lining zipped in - I would call it a 'cool' weather jacket (early Fall in Pennsylvania). I wouldn't wear it in 'cold' weather. The jacket comes with a "vest" liner, it does not have arms on the liner. My opinion after wearing this jacket - it's better as a late spring, full summer and early fall jacket as the arms have mesh panels. I'd not use for anything less than 60 degrees. Would this be good in the Fall or is this more of a two season Jacket? I used it into the fall by adding a hoodie long sleeve sweatshirt underneath.